Enter For A Chance To Win Pass To See THE FRONT RUNNER on October 11th at 7:00 PM in Minnesota. Oscar nominee Hugh Jackman stars as the charismatic politician Gary Hart for Academy Award nominated director Jason Reitman in the new thrilling drama The Front Runner. The film follows the rise and fall of Senator Hart, who captured the imagination of young voters and was considered the overwhelming front runner for the 1988 Democratic presidential nomination when his campaign was sidelined by the story of an extramarital relationship with Donna Rice. As tabloid journalism and political journalism merged for the first time, Senator Hart was forced to drop out of the race – events that left a profound and lasting impact on American politics and the world stage. 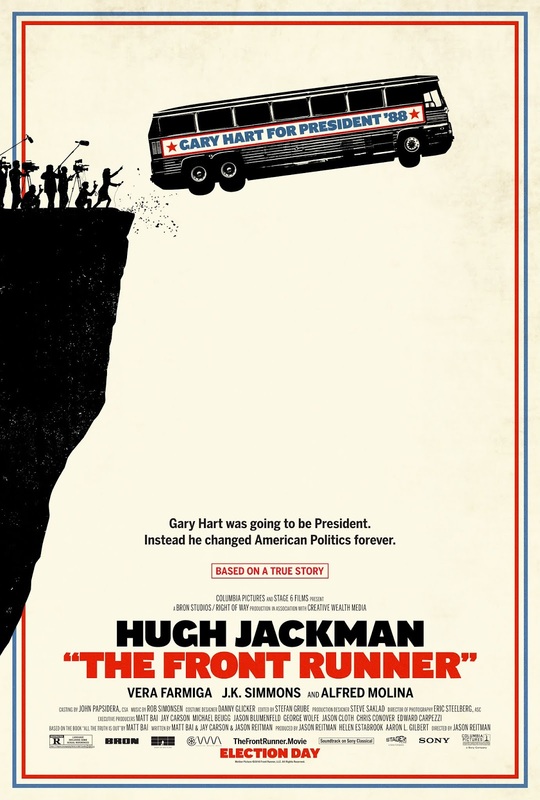 Also starring Vera Farmiga, J.K. Simmons and Alfred Molina, The Front Runner is written by Matt Bai & Jay Carson & Jason Reitman, based on the book All the Truth is Out by Matt Bai, and produced by Jason Reitman and Helen Estabrook of Right of Way Films and Aaron L. Gilbert of BRON Studios.